You can't go to the ballpark and NOT get caramel corn, right? So after my lunch of crab and garlic fries it was time to move on to something sweet. I didn't research the caramel corn in advance - rookie mistake. From my reading now, I see that there is a place that makes it to order. But that is not where I went. I just got in line at the first stand I spied that had caramel corn, enough though it seemed to be a hotdog stand. Seriously, I know better ... I think all the wine must have gone to my head! It is a bit hard to see from this photo, but this was a decent size cup of caramel corn. Certainly enough for two people to munch on while enjoying the game. I was a bit weirded out by the fact that it came with a fork. Who eats caramel corn with a fork? I quickly realized why it was provided. This was not at all what I was expecting. 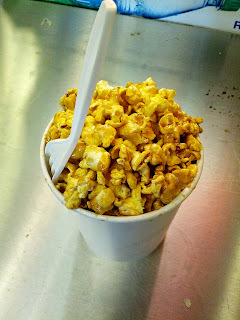 First, the caramel corn was warm. Not a bad thing. But it was also very, very gooey. I still tried to eat some with my fingers since it felt so wrong to use a fork, but it was way too sticky. Very messy. The popcorn itself was kinda soggy and didn't taste very fresh. The caramel flavor was decent, but the whole sticky, soggy thing just didn't work for me. I wanted to crunch and munch on popcorn! It also was just popcorn, no nuts or anything else added in. And $6.50? Um, no. Would not get again. A few weeks ago, while working my way through a backlog of chocolates, we tried out a dark chocolate bar infused with specks of dried strawberries. It was good, but left me seriously wanting for something with MORE strawberry, as the little flecks were just a tease (stay tuned for that review, as part of a much bigger series). What I really wanted was fresh strawberries dipped in dark chocolate, but I settled for something more easily attainable: dark chocolate covered dried strawberries. This is the only product I've had from Emily's Chocolates & Nuts, but apparently they make a large line of, well, chocolates and nuts :) They offer plain nuts, and milk and dark chocolate covered confections: nuts, dried fruits, fortune cookies, graham crackers, etc. Fun packaging and gift boxes are available, if you are looking for that sort of thing. These were good. The dark chocolate was decent quality, certainly higher quality than most of the chocolate you get wrapping other ingredients. The dried strawberries were flavorful. The ratio was a bit off for me, focusing too much on the chocolate, and not enough on the berry, although, I guess I didn't really want a giant dried strawberry. 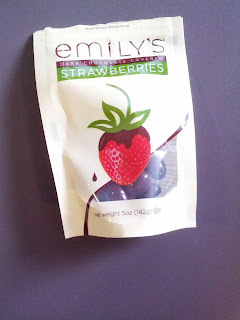 It was fun to have something chewy, but just like the aforementioned bar with flecks of strawberries, it really just left me wanting chocolate covered fresh berries.